Check the expiration date indicatedon the bag. Do not use after theexpiry date. Make sure that the bladder of thepatient has been previously emptied. Warm the package to at least 20°С before use. 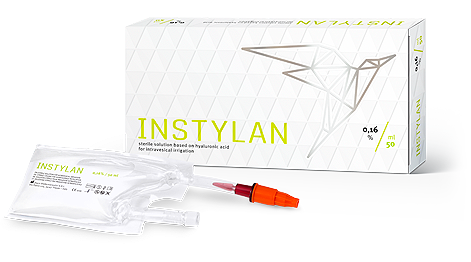 INSTYLAN® is administered into the cavityof the urinary bladder via a urologicalcatheter; the duration of therapeuticexposure is from 30 minutes to 2 hours. It is suggest that the sterile solution INSTYLAN® is used weekly for the first month and with lessfrequency in the following months. 2 years in an intact package. Store at temperatures between 5° to 30° C (inclusive),away from direct light and heat, in the adequately sealedpackaging. Sterile 50ml pre-filled disposableplastic bag which contains 0.16 % (80mg/50ml) of hyaluronic acidsolution with a urethral catheter connector in a vacuum plastic packaging.